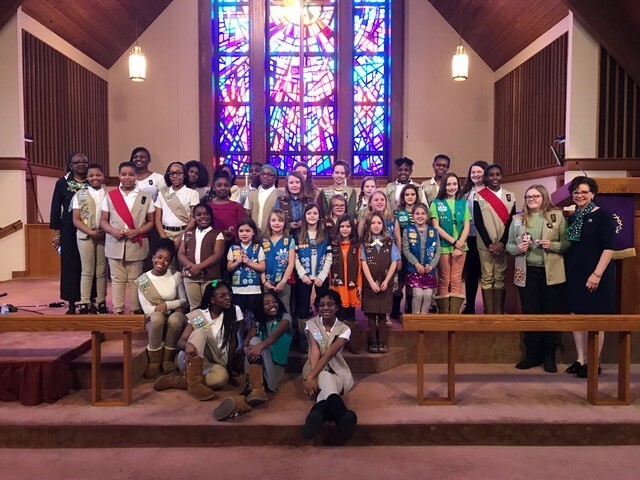 Over 30 Girl Scouts gathered to lead worship and celebrate Girl Scout Sunday on March 10, 2019 at Mount Zion United Methodist Church in the Girl Scouts of Eastern Missouri Council. This annual event is girl-led, including the flag ceremony, call to worship, scripture reading, and even the message. Four Star Recipient Samantha T. delivered the message and told how the P.R.A.Y. religious awards have impacted her: “Not only did my Faith grow through this program but so did my confidence in myself. 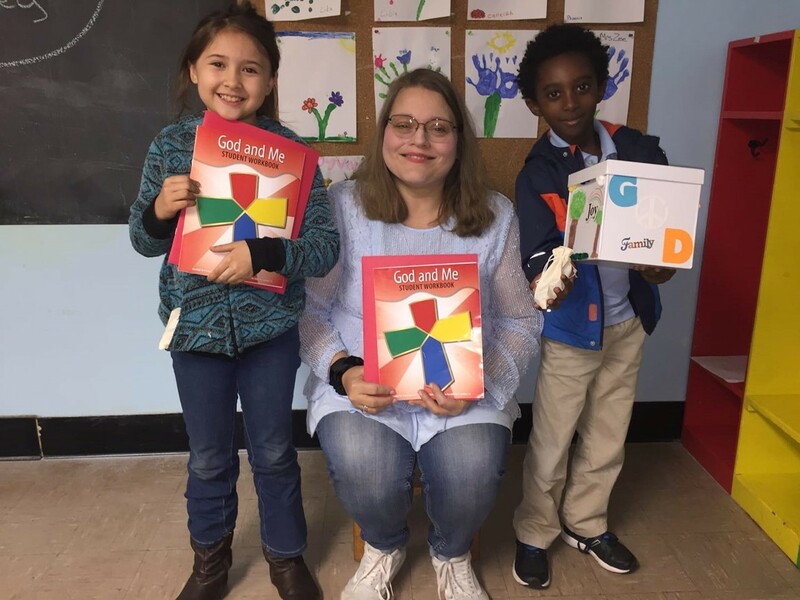 I grew closer to God and was finally able to open up to the people and world around me.” Samantha went on to explain what she learned at each program level and how “the colors red, yellow, blue, and green mean so much to me” (referring to the four-color cross on the P.R.A.Y. awards displayed proudly on her uniform). Not only did Samantha earn all four levels, she also assisted with the younger classes. 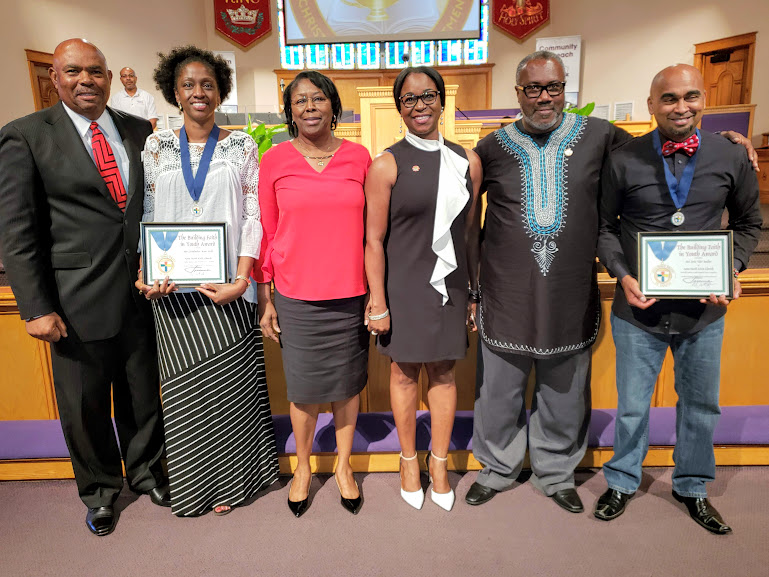 Girl Scouts were recognized by the Christian Protestant Girl Scout Committee for earning the My Promise, My Faith pin. Girl Scouts who earned a P.R.A.Y. award received a special patch. All Girl Scouts in attendance received a Girl Scout Sunday patch. Thank you to Rev. Kyle Butler and Mount Zion United Methodist Church for hosting the event. Thank you to Girl Scouts of Eastern Missouri for their support! 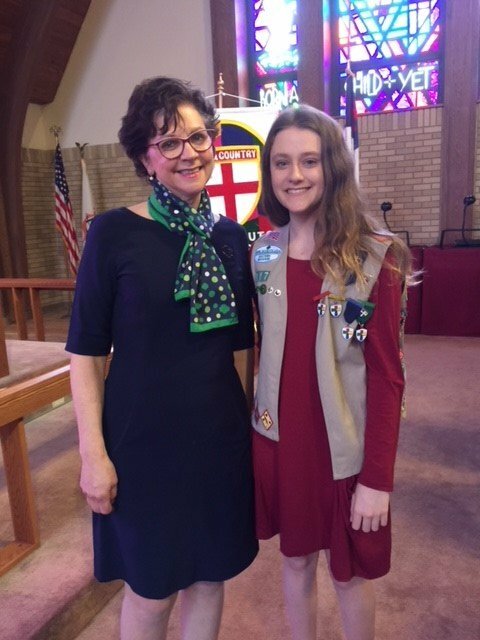 Photo: Four Star Recipient Samantha T. is pictured with Kathy Dabrowski from the Girl Scouts of Eastern Missouri Council. 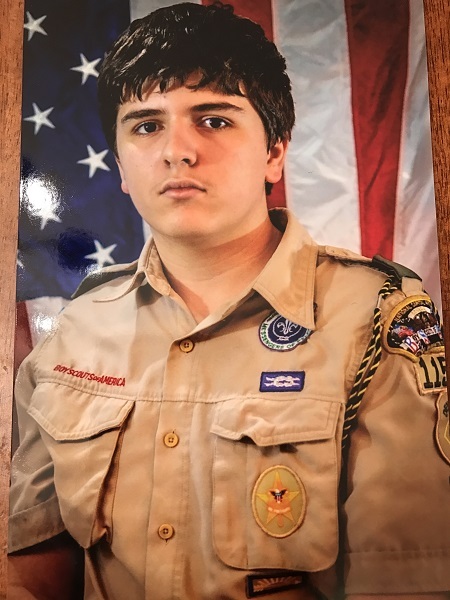 From Tricia Burgess: "I am so proud of these two Cub Scouts from Pack 125 from Salem, South Carolina. 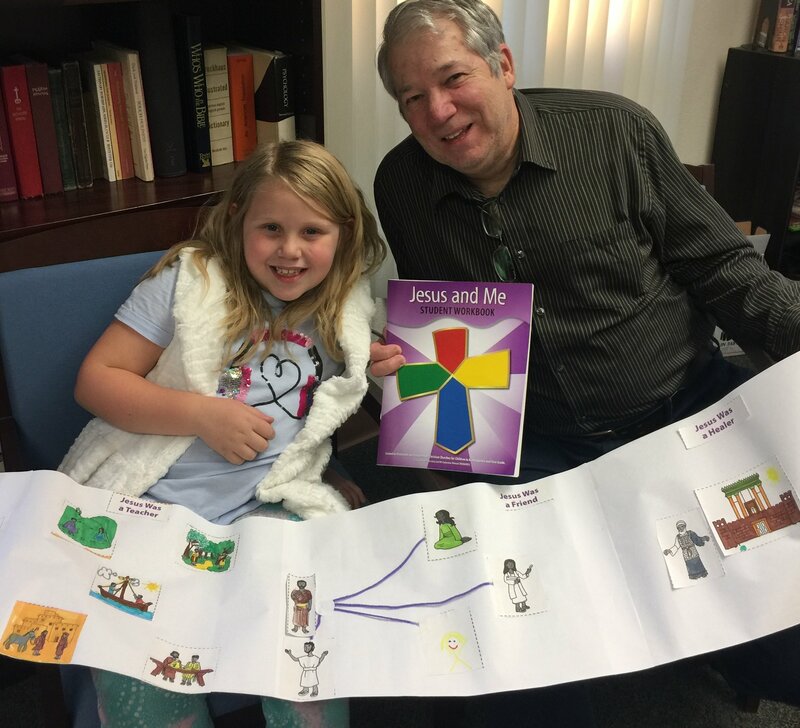 Ray G. and Harley W. worked hard on their God and Family workbooks. In class, Ray was always eager to look up the Bible verses and read the stories out loud. And I was so proud when we were playing the "Jeopardy Game" at the end of the sessions, Harley picked the question that asked him to recite the 10 Commandments. He was able to say them all, and in order, using his 10 Commandment Finger Counting that he learned in Lesson 4. On our last night of class, they made their own individual pizzas and Ray even tried anchovies for the first time. 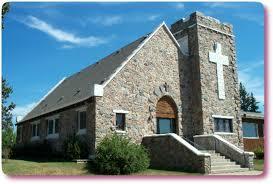 Thank you to Salem United Methodist Church for providing location for our classes." 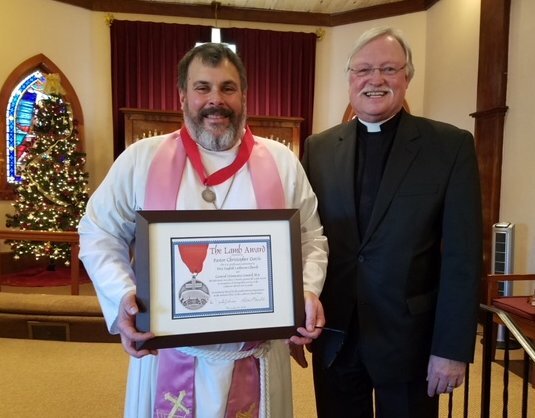 Charles Howard Miller received the Lutheran Servant of Youth award on a blustery winter day from Rev. Dee Pederson of Bethlehem Lutheran Church in St. Cloud, Minnesota on February 10, 2019. Charles was recognized for his service to the church (as Sunday School music leader, confirmation guide, and Wednesday evening service musician) and also to the Boy Scouts of America (as Pack Committee member, den leader, Webelos leader, Pack trainer, and now as Troop Committee member and member of the Scenic District in the Central Minnesota Council). 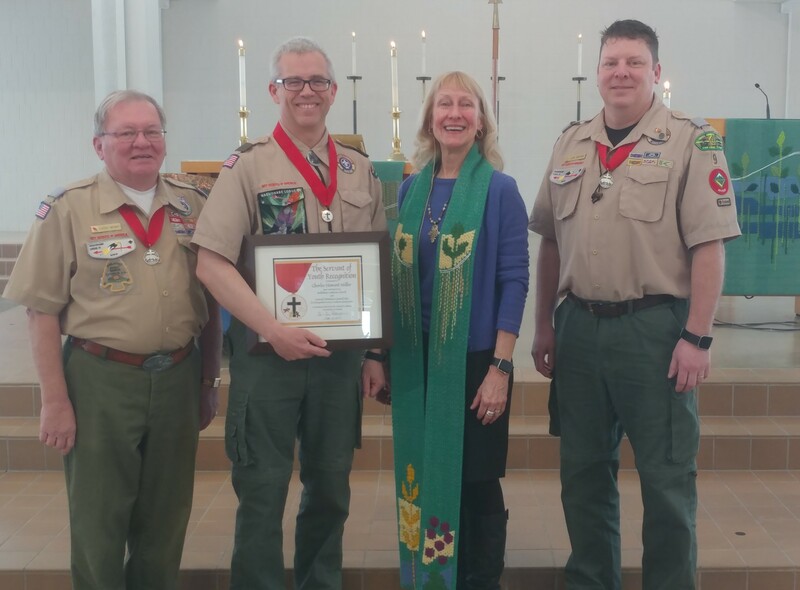 Presenting the award were Loren Meinke (National Lutheran Association on Scouting), Pastor Dee Pederson, and Jon Meinke (long-time friend, fellow professional and troop member). 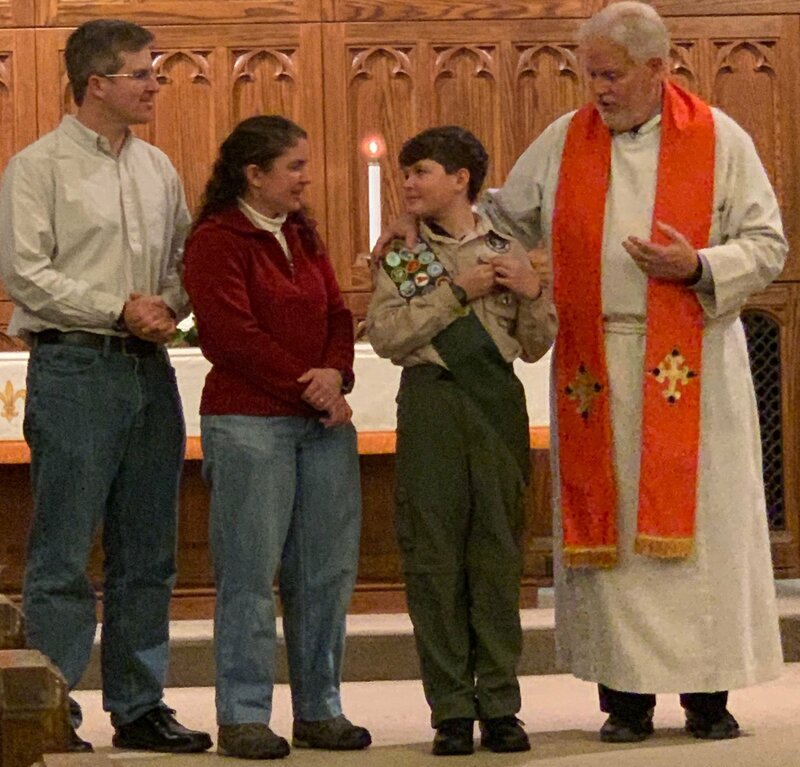 Cub Scouts Leah and Noel received their God and Me awards at St. Mark’s United Methodist Church in Hampton, Virginia on February 17, 2019. Also pictured is Shannon Waszak from Pack 30. 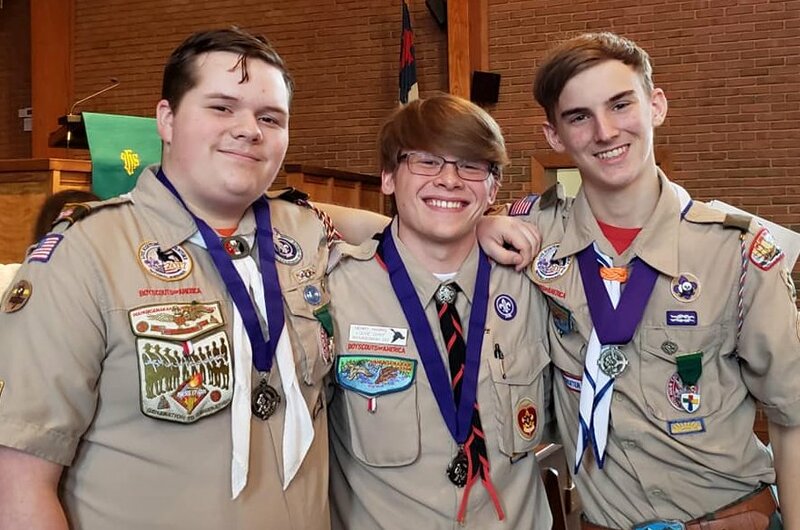 Pack 30 celebrated 10 years in providing the God and Me and God and Family religious growth programs. Congratulations Leah and Noel! 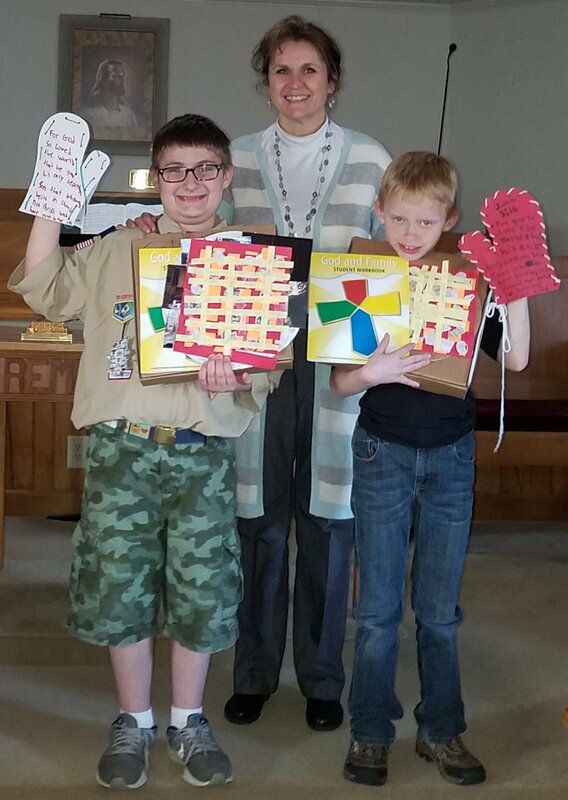 Thank you, Pack 30, for promoting Duty to God! Lottie from Harker Heights, TX and Emma from St Louis, MO have something in common: Both are Girl Scouts and both were among the first to earn the new Jesus and Me award. 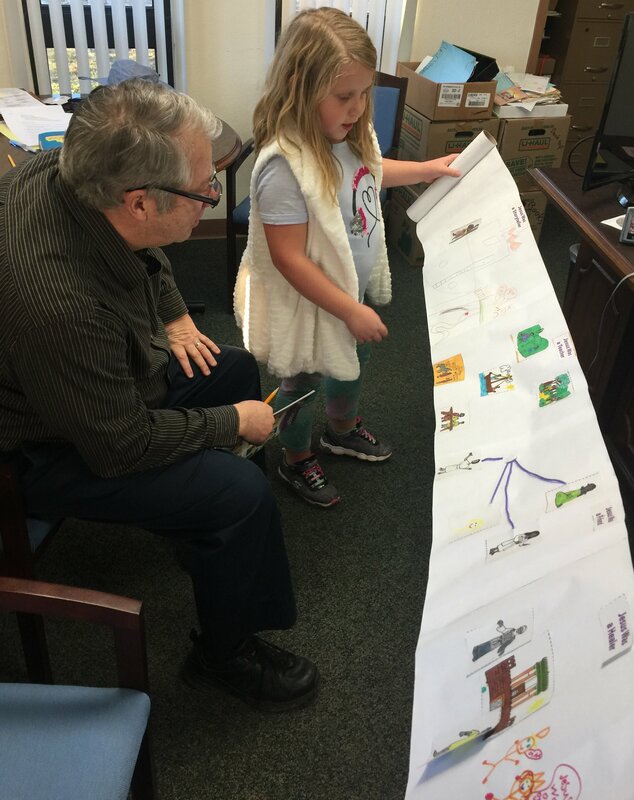 Emma is a first grader and thinks “everybody should make a scroll!” She was surprised (and pleased!) 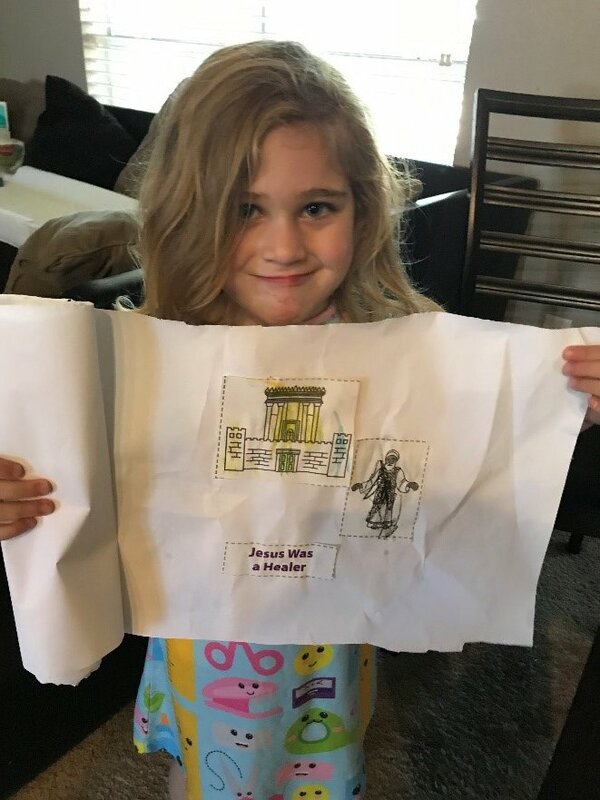 with how long her scroll turned out, and she especially enjoyed the final review with the pastor.